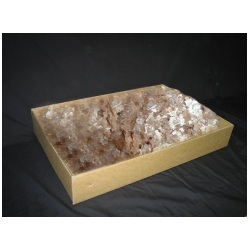 Mica Flakes is mica scrap grinded into sizes ranging from 2 mesh to 30 mesh. We prepare natural mica flakes mainly by the means of rotary hammer crushing machine (Pulvigator) in which the mica is beaten till such time that the required size is not achieved. Grinded into various sizes from pure muscovite mica, our natural mica flakes are greatly sought after by industries involved in manufacturing of pearlescent pigment, concrete block fillers, refractory bricks, asphalt roofing felts, metals explosives and disinfectant etc. 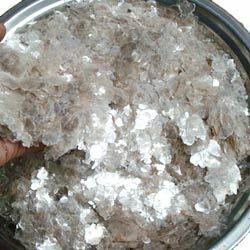 We also manufacture Untested Mica Flakes for which the raw material used are the untested/ white mica scrap. We offer Grade-B Mica Flakes to our clients. Natural mica flakes of 2nd quality (after removing all foreign impurities) when crushed & reduced to size between 2-8 Mesh using a Pulvigator forms normal mica flakes. This grade contains little percent of biotite & gives slightly muddy look as compared to the Super grade. Fine Mica Flakes of best quality after removing all foreign impurities) when crushed & reduced to size between 2-8 Mesh using a Pulvigator forms super mica flakes. 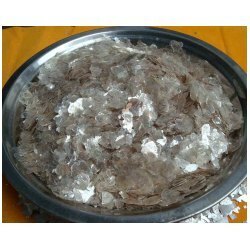 Natural Mica Flakes (tested) is made from selected grade of ruby mica. While processing and manufacturing, the raw material is dried to get rid of any moisture and then screened to remove dust. After that all foreign particles like biotite, quartz, straw, bamboo (organic and inorganic material) are removed manually by hand picking process. Thus the impurity free raw material is sheared in Pulvigator and screened properly to get the desired Mesh size (generally 2-8 Mesh) of natural ruby mica flakes. Looking for Mica Flakes ?